Brand new from Gryphon Games is Fleet, a strategic card based game that features a unique commercial fishing theme. In the northwest corner of Nunavut, Canada, a formerly inaccessible bay off of the Arctic Ocean has become reachable through a secret inlet. Untouched by the hands of time and fed by both the ocean and warm fresh water springs, Ridback Bay is teeming with sea life. Acquire licenses, launch boats, and fish the great briny blue. 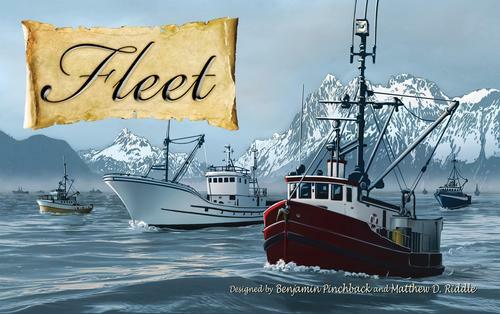 The player who best manages his resources and acquires the most Victory Points via fish licenses, and boats will build the strongest fleet and lead his crew to victory! 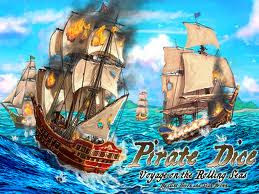 Also new out from Gryphon Games is Pirate Dice: Voyage on the Rolling Seas, a strategic dice game. Players compete to be the first to find the sunken treasure in Treasure Cove. Will glory and fame be yours, or will you and your crew end up at the bottome of the sea? Players roll and place customized command dice to pilot their ships around the sea. Commands allow ships to move, turn, fire cannons, and even interfere directly with their opponents! Love Letter is a card game of risk deduction, and luck stowed in a red and gold velour "Love Letter" pouch. Win the Heart of the Princess! Get your letter into Princess Annette's hands while keeping other players' letters away. Powerful cards lead to early gains, but make you a target. Rely on weaker cards for too long and your letter may be tossed in the fire! All the eligible young men ( and many not so yung) seek to woo the princess of Tempest. 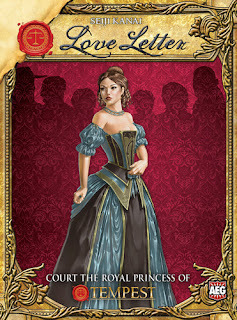 Unfortunately, she has locked herself in the palace, and you must rely on others to bring your romantic letter to her. Will yours reach her first? Carcassonne: The Flier - eight landscape tiles showing a pair of wings are mixed with the other tiles to be used in the game. As flying enthusiasts, the players want to actualize mankind's dream of flying by trying their wings. Flight length and landing places can be troublesome. Carcassonne: The Messages - eight message tiles and six new followers. 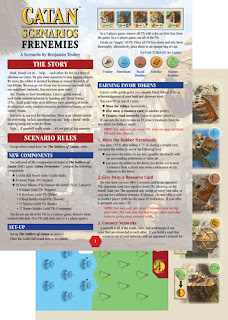 Players gain a second scoring meeple to aid in securing messages. Messages and grant additional points for smallest road, city or cloister, banners in a city, or knights... many possibilities. You may even get to draw and play an additional tile. 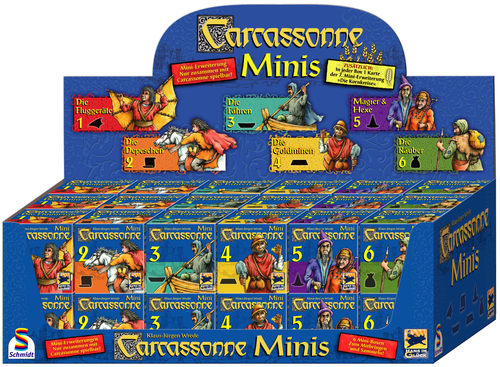 Carcassonne: The Ferries - eight landscape tiles and eight ferries. Some roads around Carcassonne lead to small lakes. In these places ferries are operated to connect the roads on one side of the lake to the roads on the other side. These present new opportunities for the players. Carcassonne: The Goldmines - eight landscape tiles and sixteen gold bars. Gold! The excitement is huge and many come to acquire the precious metal for themselves. At the end, all will settle their accounts. Carcassonne: Mage & Witch - eight landscape tiles and two wooden figures. Magical people visit the county of Carcassonne. While the power of the mage brings extra value for roads and cities, the inhabitants view the abilities of the witch rather distrustfully. Carcassonne: The Robber - eight landscape tiles and six wooden robbers. Gangs of robbers are on the way and require their tribute. When followers score points, the robbers take some points for themselves. 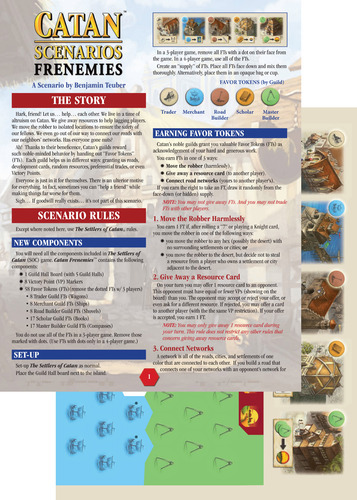 New for Settlers of Catan fans is this mini expansion, Catan Scenarios Frenemies. Hark, friend! Let us… help… each other. We live in a time of altruism on Catan. We give away resources to help lagging players. We move the robber to isolated locations to ensure the safety of our fellows. We even go out of our way to connect our roads with our neighbors’ networks. Has everyone gone nuts? Ah! Thanks to their beneficence, Catan’s guilds reward such noble-minded behavior by handing out “Favor Tokens”. Each guild helps us in different ways: granting us roads, development cards, random resources, preferential trades, or even Victory Points. Everyone is just in it for themselves. There is an ulterior motive for everything. In fact, sometimes you can “help a friend” while making things far worse for them. Sigh… If goodwill really exists… it’s not part of this scenario.